What does it take to become a famous musician? Answer: it takes everything. EVERYTHING. But, and this is the funny thing about this line of job, even if you don’t intend to become famous, becoming a working musician ask for everything you got. And then some. Today we are going to talk about the part that goes “And then some”. So, you are a great musician. You are more than great, you are a genius. You play the piano like an angel, you can compose swinging hits, life is wide open for you. But you are in the South of United States, you live in the 50’s, you are black and you are blind. What are now the odds of you becoming a working musician, let alone a famous one? Did you recognize the man I was describing? Yes, you are correct, his name is Ray Charles. Ray Charles is a great example of someone who ended up at the top against all odds. Stevie Wonder is another one, if we go with the same style of music and almost the same era. John Mellencamp, in a speech for graduating students, describe what records executive were saying about him. I paraphrase here, but it went something like this: “They said: John’s voice isn’t that great. His band is ok. His composition are weak. The style is almost obsolete.” Then, with a smile, John Mellencamp concludes: “He’s cute though!”. Against all odds. It is what every musician who wants to make a living at this art needs to understand. A few examples would be welcome here. All right: Beethoven was deaf. Before them, before U2 I mean, Ireland didn’t have superstar bands. Manu Katche is a French drummer on the international scene. The band The Clash was from the worst part of London, rehearsing in a toilet. Bob Dylan couldn’t count on his voice the way Sting can. Charlie Parker was asked to leave the stage the first time he jammed with a jazz band. Chick Webb, the great band leader of the Savoy, the very one that influenced Buddy Rich’s playing, was a very short man with a deformed body due to a tuberculosis of the spine he contracted when he was a kid. 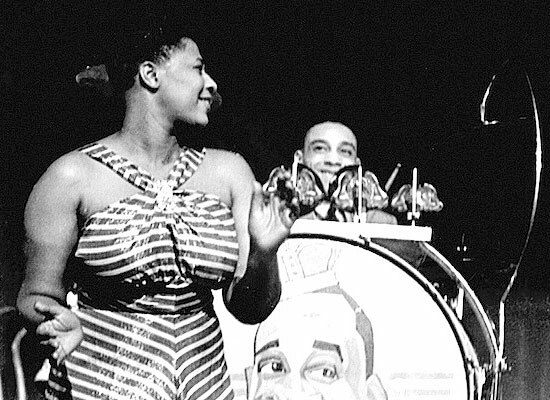 His greatest partner, Ella Fitzgerald, was “not a glamour girl” according to herself. And the list goes on and on. I am also against all odds. I am a French guy teaching american people the drum set, an instrument invented in the New World. I came to the U.S.A, I did not know how to say “bread”. Fortunately I had my index to point at things and I wasn’t shy. Against all odds. I tell my students, the ones that are dreaming the impossible dream, the ones that want to pay all their bills with music that there is no excuse. None at all. You do it because you can’t help it. And if the odds are stacked against you, you still find a way to make it happen. Ray Charles was a musical genius and a great man. What he accomplished is incredible. Against all odds.